My love of music is probably at the deepest core of my being. I love to share that gift with people. Here are some places you can share my musical efforts. Your purchases help support creation of more music! My music is a mix of Native American Flute traditions with influences from Jazz, Blues, and Estonian Folk music. I love the warm and traditional sounds of the wooden flutes, and also blending the flutes with piano, guitar, and other more eclectic instruments to create unique music. It is an exploration journey of the moment. Click here to listen and purchase! My premier album, Karu Eestis 2013 (Bear in Estonia) is now available for electronic download. Recorded live in various locations in Estonia, my mother’s homeland, dedicated to my relations there. Sounds of the Baltic Sea, and echos of long-destroyed churches underlay the sweet sound of the Native American Flute. The title is Estonian for “Bear in Estonia!” Please listen and purchase! Order your Karu Eestis 2013 CD now! More music — mostly duets and singles! Hosted on Bandcamp. Find videos and more music on my Youtube channel! Other albums and songs you can listen and buy! A wonderful red cedar flute made by David Nighteagle found me at a rodeo in 1999. It has a soft, bluesy tone, and sings so sweetly. One of my favorites. I have one of Jonah Thomas’ (Navajo) pine flutes with a carved bear fetish. I am the very proud owner of two of Ward Stroud’s “Mystic Double Flute”, and one of Ward’s hand flutes. One of the doubles has a stunning pair of carved horses, and the other two bears. In September 1999, my wife and I stopped and visited Ward. My wife bought one of Ward’s “F#” flutes. I added a wonderful South American Kena. In the spring of 2001, a Raymond Redfeather cedar low Bb, a High Sprits (Odell Borg) maple high C and cedar high A joined the collection. In June, I added a Scott Loomis maple F, with a carved duck on the end. Wow! Spring 2002 saw the addition of a Coyote Oldman “high-A”, which just sings so sweet…! Spring 2003 arrived with two Stellar flutes, a high-C cedar, and an F# in the most lovely quilted juniper I’ve ever seen! Bear playing at the edge of the Royal Gorge, Colorado. The collection continues to grow, with one of Ray Redfeather’s flutes early in 2004. It is a “mid-A” in cedar, with a stunning carved woodpecker at the end. It has such a clear and stunning voice that I often turn the mic off when playing in performance. It just doesn’t need the electronic help! The collection continues to grow, and I have lost count. My favorite flute players include Ron Roybal, Mary Youngblood, R. Carlos Nakai, and Ward Stroud. We have heard Ron Roybal play at several pow-wows, and have driven to New Mexico to hear him at the Hotel Santa Fe dining room. 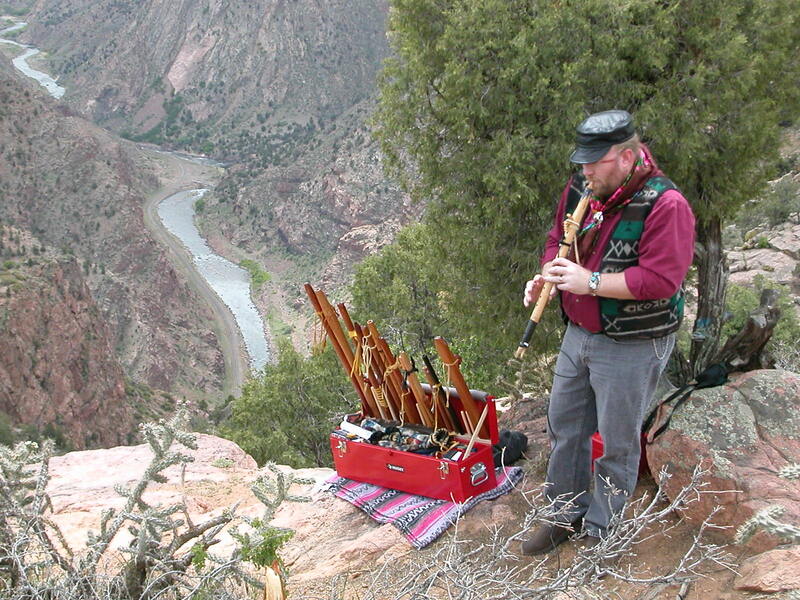 The picture at right is of me playing for a wedding at the edge of “The Royal Gorge”, near Canon City, Colorado.